A plaque commemorates the 90th anniversary of the founding of the Catholic parish. Bellingen was the centre for the Parish of Boat Harbour formed in 1881 which covered the Nambucca and Bellinger Valleys. 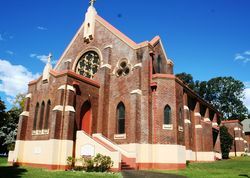 Following the departure of Father Reade , the parish centre was moved to Bowraville. Some time around 1905, Bellingen was separated from Bowraville but continues to share the same pastor. It was not until 1908 that Belligen was formally constitued a parish with its own parish priest. The first recorded Catholic settlers, Bernard and Mary McNally from County Armagh, Ireland, came with their children and their faith to the Belligen River District about 1864. For many years the home of Bernard and Mary McNally was the Mass house in Bellingen. Mary died in tragic circumstances in 1868 after only four years at Bellingen. Bernard ("Old Briney") died in 1880. They had seven living children. Their home was constructed of slabs and stood at Ford St near the river bank. 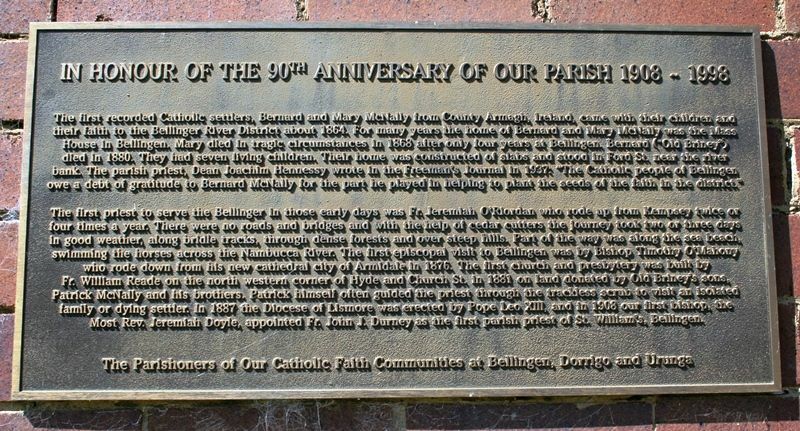 The parish priest, Dean Joachim Hennessy wrote in the Freeman`s Journal in 1937, "The Catholic people of Bellingen owe a debt of gratitude to Bernard McNally for the part he played in helping to plant the seeds of the faith in the district." The first priest to serve the Bellinger in those early days was Fr. Jeremiah O`Riordan who rode up from Kempsey twice of four times a year. There were no roads and bridges and with the help of cedar cutters the journey took two or three days in good weather, along bridle tracks, through dense forests and over steep hills. Part of the way was along the sea beach, swimming the horses across the Nambucca River. The first episcopal visit to Bellingen was by Bishop Timothy O`Mahony who rode down from his new cathedral city of Armidale in 1876. The first church and presbytery was built by Fr. William Reade in the north western corner of Hyde and Church St. in 1881 on land donated by Old Briney`s sons, Patrick McNally and his brothers. Patrick himself often guided the priest through the trackless scrub to visit an isolated family or dying settler. In 1887 the Diocese of Lismore was erected by Pope Leo XIII, and in 1908 our first bishop, the Most Rev. Jeremiah Doyle, appointed Fr. John J. Durney as the first parish priest of St. William`s, Bellingen.